Plants need light, mineral salts (fertilizer), and carbon dioxide (CO2) to grow, and their survival and reproduction depends on the right proportions of these elements. A fishkeeper also needs to be an aquatic gardener and have "green fingers" to cultivate his or her live decor. 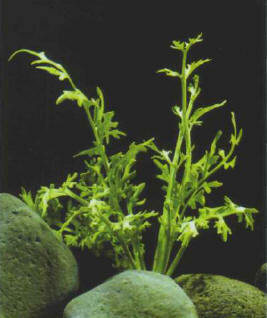 Aquatic plants are in general very sensitive to the water quality. You must respect the needs of plants to obtain optimal growth and reproduction. Although some plants, such as the floating fern, are easy to keep, and seem indifferent to the quality of the water, others require water that is soft and acid or, alternatively, alkaline and hard, and will only flourish in water that is adapted to their specific needs. Plants have an overwhelming need for light, whether natural or artificial, to grow and produce oxygen, once they have absorbed carbon dioxide. Aquarium plants usually need strong lighting, produced by special fluorescent tubes for 12 or 13 hours a day. If the lighting is deficient in either quality or quantity, the plants will turn yellow and eventually die. Like all living beings, plants are continuously respiring. They consume oxygen and expel carbon dioxide, thereby affecting the oxygenation of the water, both in a natural setting and an aquarium. 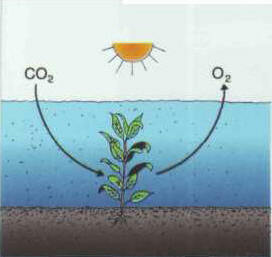 By contrast, in reaction to light - therefore only by day - they absorb the carbon dioxide from fish respiration and produce oxygen: it is this photosynthesis that enables them to grow. This phenomenon has a beneficial effect on the equilibrium of the aquarium, as it results in the production of more oxygen than the plant consumes in its respiration. There may be slight variations in the oxygen levels from day to night, with the minimum levels being reached in the last third of the night. An aquarist (preferably an insomniac!) can verify this by measuring the pH every hour in a cycle of 24 hours. An increase in the water's oxygen level pushes up the pH, while the production of CO2 at night acidifies the water and the pH goes down. This phenomenon, which is only really visible in heavily planted and densely populated aquariums, rarely entails any problems for fish. add solid fertilizers, in the form of sustained- release mineral salt capsules placed at the base of the plants. You can also make a solid fertilizer at home, based on clay. Knead it, form small balls, then have them soak up liquid fertilizer. Placed at the base of plants, these balls gradually release their nutrients. This name covers all the substances needed for the growth of aquarium plants. They are in fact the equivalent of the fertilizers that are used in agriculture, or for house plants. Plants' needs vary according to the substance: some are only required in tiny amounts (metals, for example) but they must be constantly available. Mineral salts are absorbed by the roots and leaves in truly aquatic plants, and by the roots in amphibian plants. In the natural environment, some aquatic areas are considered fertile, as the renewal of the water and the equilibrium of the natural cycles provide sufficient amounts of mineral salts for plants to prosper. Those regions lacking these vital elements are characterized by sparse vegetation, or none at all. In an aquarium, which is a self-contained environment, the water and the bed contain mineral salts that will gradually run out, at a rate determined by the quantity of the vegetation. You must therefore make plans to reinforce the mineral salt level on a regular basis, as you would for extensive planting is envisaged for the aquarium. A FEW RULES FOR A NOVICE "AQUATIC GARDENER"
Choose plants suited to aquarium water. Choose hardy species, some rapid growers and other slower. Satisfy their needs, especially as regards special lighting. Check the supply of nutrients. Do not hesitate to ask for advice, from your aquarium store owner or from clubs and associations. There is usually enough carbon dioxide in the water, but it can sometimes be deficient, even in a tank that is profusely planted and well lit. If this occurs, the carbon dioxide that has been trapped by the bicarbonates is used in its turn: the pH often rises above 7.5, sometimes even up to 8, in fresh water, and the calcium forms a fine layer on leafy plants and "suffocates" them. Deposits can also be seen on the glass panes, at water level. Carbon dioxide diffusers are available in the aquarium trade to remedy this problem. You must also bear in mind that aeration and stirring of the water, which contribute to its oxygenation, help expel the CO2 dissolved in the water into the atmosphere. This means that excessive stirring can sometimes have dire consequences for plants. 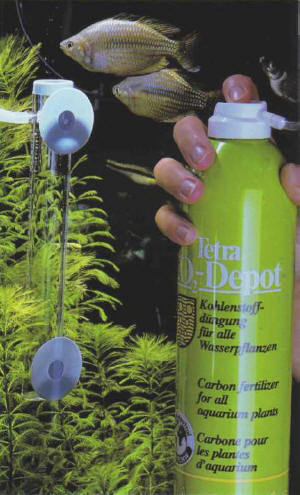 Nowadays specialist aquarium stores stock equipment designed to supply plants with the CO2 they need. Potassium, which is a component of other salts. ЦИКЛОТРОННЫЙ РЕЗОНАНС , резонансное поглощение электромагнитной энергии в полупроводнике или металле, находящемся в постоянном магнитном поле, связанное с квантовыми переходами носителей заряда между орбитальными уровнями энергии. Циклотронный резонанс позволяет определить эффективные массы носителей заряда в полупроводниках и др.